It is natural to want to save money even if you often shop online. TopBuyer and other similar applications promise that if you install them onto your computer, you will get immediate access to various discount offers and coupon deals. However, there is the other side to this offer – a risk to your cyber privacy and security. Therefore, our security analysts strongly encourage users to remove TopBuyer the moment they realize this application is installed on their computers. There is no need to keep TopBuyer on your computer because this application can hardly live up to its promises. It is easy to see that TopBuyer is unreliable because, for starters, the official homepage is dysfunctional. It is possible to access topbuyer.info, but there is no direct download available, and you are presented only with the most basic and generic information on the product. Next, TopBuyer is closely related to SalesChecker, Deal4me and ShopNDrop applications. It means that even if there is no direct download link for TopBuyer, the application usually travels along with InstallRex installers (and sometimes Vittalia and Amonetize installers). It is very likely that you have installed TopBuyer onto your computer after you clicked a fake download link on a torrent or some file sharing website. It is also possible that TopBuyer arrived onto your PC together with a list of other unwanted applications. Hence, when get ready to remove this program from the system, make sure you get rid of all the other potential threats as well. Take note that this program may be installed under different name from a computer to computer. After all, TopBuyer is a semi-random name adware based on JustPlugIt engine. Some of its name variations include tobuuyieer, toPbuyeor, toppbuyer and others. Aside from the entry on the list of installed programs in Control panel, TopBuyer also installs a plug-in on your default browser (Internet Explorer, Mozilla Firefox or Google Chrome). With the plug-in on your browser, this application can see what website you frequent, and it also tracks your most common web search queries. Tracking your web browsing habits helps TopBuyer generate customized advertisements, and consequently, it increases the possibility of you clicking the ads. When you click an ad, you get redirected to an affiliate website that employs pay-per-click system, and so you generate money for TopBuyer creators. Unfortunately, does not help you to buy various goods at an optimal price. It also can expose you to potential security threats because TopBuyer does not check what kind of content is added to its advertisements. So before you know it, you might click an ad that redirects you to malware-related website. Do not let that happen and terminate TopBuyer today. When you remove it from the system manually, use SpyHunter free scanner to scan the PC. This way you will see whether you have to delete any other unwanted programs. Get yourself a licensed antispyware tool if need be. Select Uninstall a program and remove TopBuyer. Open Uninstall a program and remove TopBuyer. 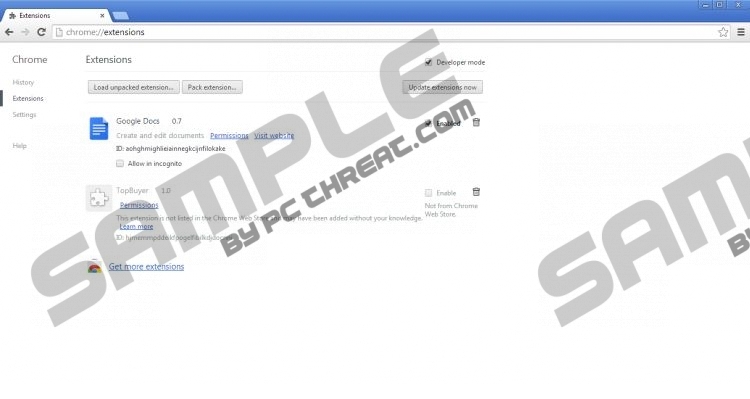 Double-click Add or remove programs and uninstall TopBuyer. Disable and remove TopBuyer from Extensions. Select Extensions and remove TopBuyer. Quick & tested solution for TopBuyer removal.